Giant gnarled trees rise from huge piles of sandstone blocks; spreading roots and creeping vines cloak massive walls, dense foliage obscures crumbling towers and moss and lichen conceal intricate carvings. 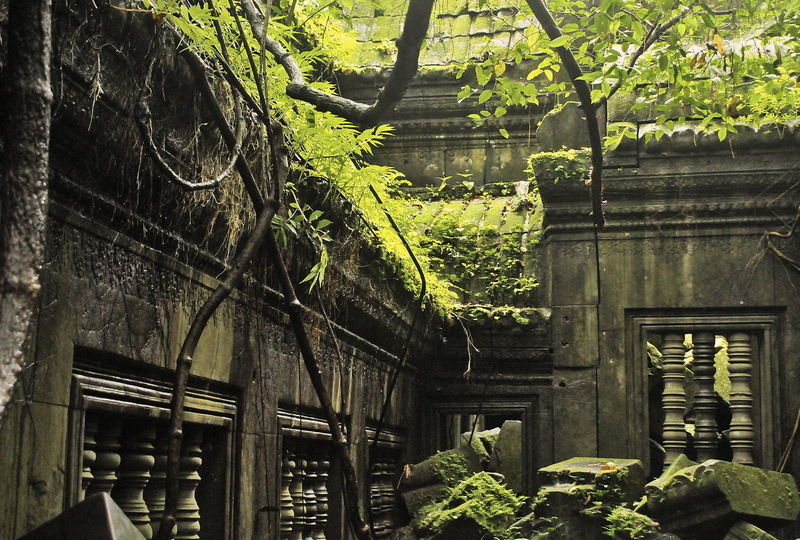 Cambodia’s Beng Melea; chaotic, decaying ancient ruins and rampant tropical vegetation is a perfect synthesis of man’s handiwork and untamed nature and a complete antithesis of what it was originally intended to be. Whoever began construction it is stylistically typical of the early 12th century Angkor Wat period and other historians have suggested it may have been a prototype for the very similar, albeit larger, Angkor Wat itself. Beng Melea is nonetheless a massive temple though size apart, the main difference between the two lies in their state of repair. 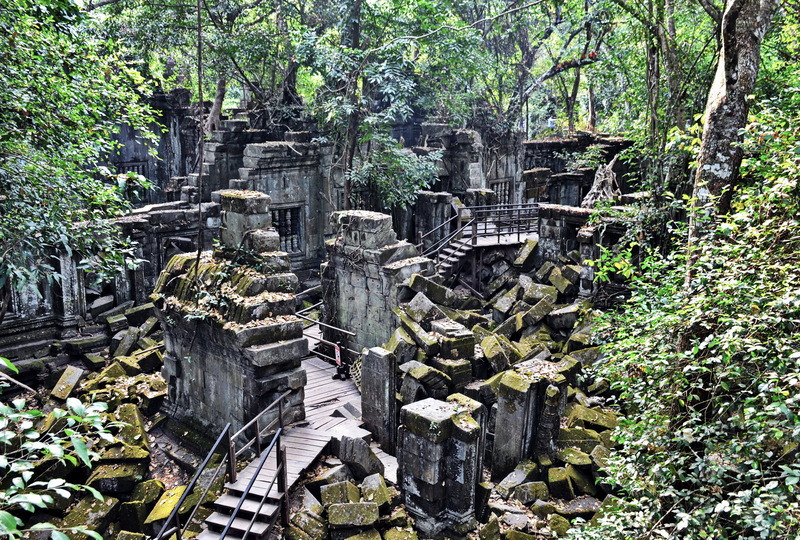 Whilst Angkor Wat was never completely abandoned and some form of minimal maintenance prevented the tropical forest from ever completely taking over, Beng Melea today is in a totally ruined and jungle-clad state. 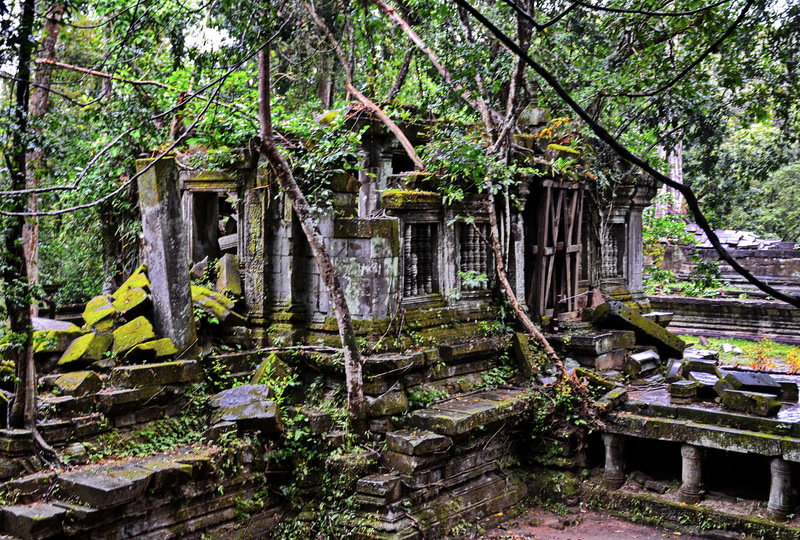 Even if it might have been partly subconscious, one of the salient motivations of ancient Khmer temple building must have been the imposition of structure and order on the anarchy and chaos of untamed nature. The near obsessiveness of these temples’ architects and designers; the symmetry, precise angles, accurate measurements and formal, rigid layouts confirmed the hand of man’s dominance over the vast, and at times hostile, jungles of the Cambodia of 1,000 years ago. 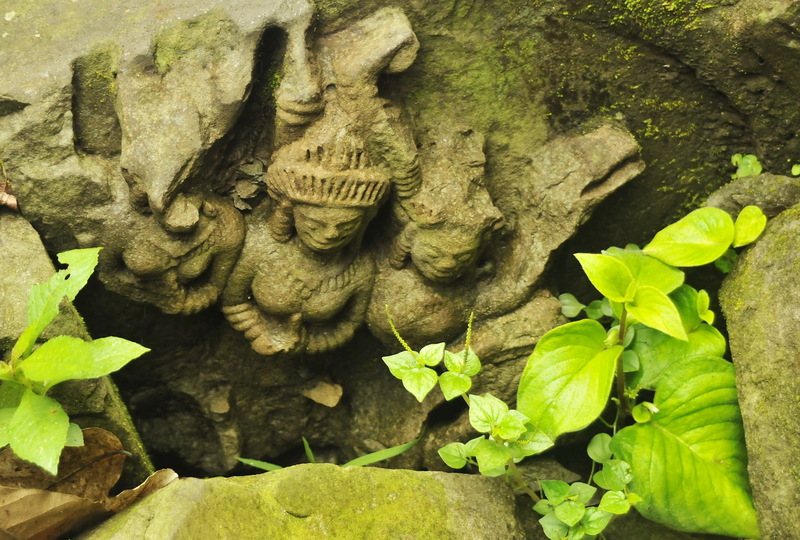 Nothing in temple design was left to chance; the neat geometric pools and moats, the false doors and windows and lintel carvings – there’s not an apsara out of place and certainly no room for curved walls, obtuse angles or an uneven staircase. 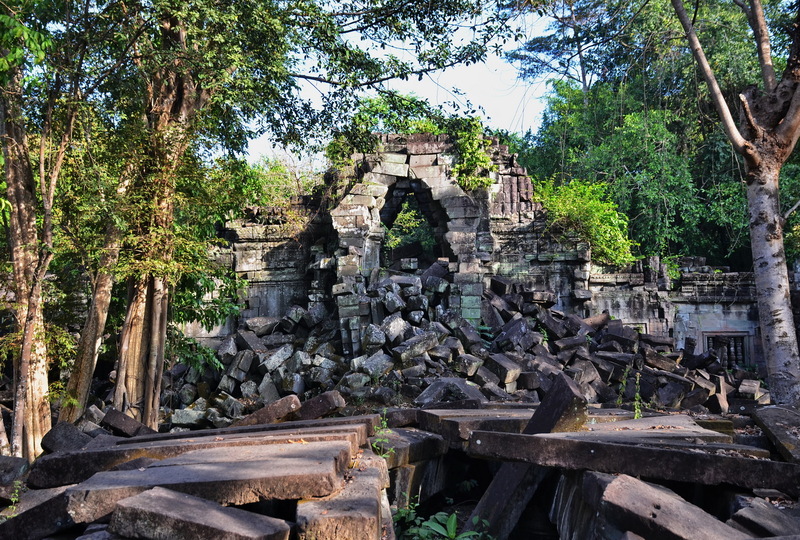 So the majestic chaos of the ruined Beng Melea we can see today is indeed the exact opposite of the original intention yet in our modern over-structured and obsessively ordered society with our largely well-tamed nature it’s exactly this type of Angkor temple that consistently proves to be the most popular. Indiana Jones style, Lara Croft-esque roots, giant trees and jungle-covered ruins are the stuff of postcards and holiday photos, (any apsara looks better for a bit of moss or entwining root! 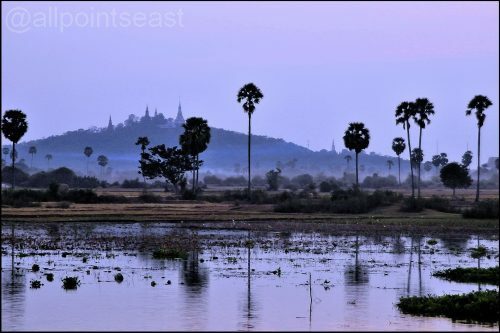 ), and for many the relative good condition and state of preservation of say Angkor Wat is merely there as a sunrise location. 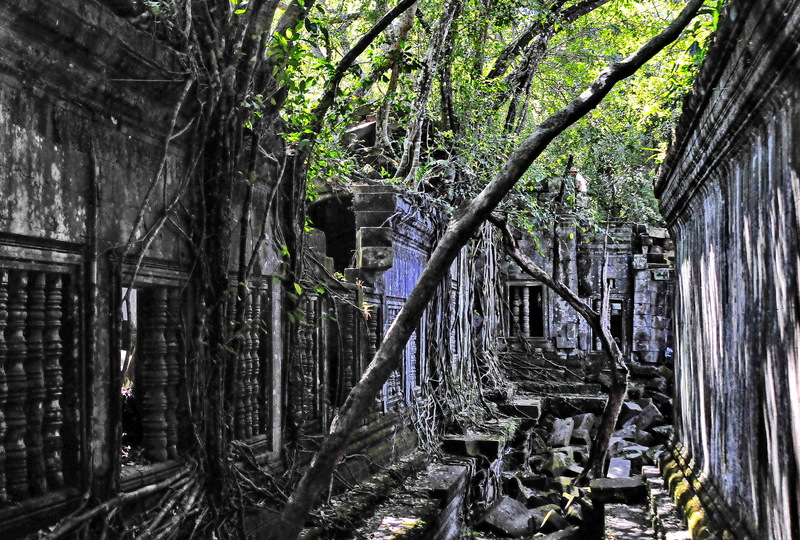 Yes, the famous and picturesque ‘jungle temples’ of Ta Prom and Preah Khan are starting to become crowded but Angkor temples are a bit like Thai islands – once one becomes too popular there’s always another remoter one further on that the crowds or Lonely Planet haven’t ruined yet. 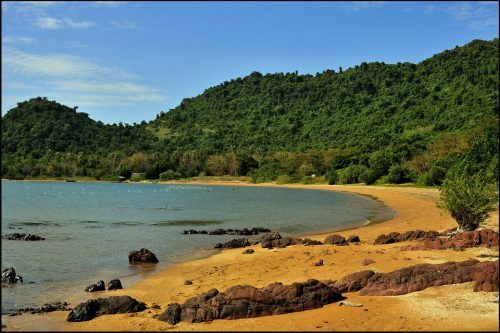 Anyway, Beng Melea’s still one of the lesser-visited sites, so Koh Ker and Banteay Chmar can wait in the wings for now, and you can visit the temple on an All Points East ‘Beyond Angkor‘ tour or organized as a special day trip from Siem Reap.